The Divine Sports of Krishna provides a contrast to philosophical texts on non-duality and the practice of meditation and related disciplines. These poems are expressions of pure, loving devotion to God in human form. The poems translated here have been immensely popular and influential among those who follow the way of devotion. They were written in the sixteenth century CE by Surdas, one of the most widely-read of the poets who have contributed to the popularity of devotional practices among the people. Little is known of the life of Surdas. He seems to have come from humble origins and was either born or became blind. Evidently, his physical blindness in no way diminished the brightness of his inner vision. Best known are his poems of devotion to the child Krishna, whose playful ways capture the hearts of the milk-maids and others among whom he grows up. Flung away custom and lore. Had robbed them of their hearts. Despite the apparent simplicity of these poems, the truth of Krishna’s real nature as the absolute supreme is never far from the surface. And there are episodes of direct teaching value, such as when Krishna, later in life, sends a scholarly friend, proud of his philosophical acumen, to tell the milk-maids of the villages about meditation on the absolute, to which these perfect devotees react with derision, revealing to the scholar something that his philosophy books do not contain. These poems express a kind of emotional uncomplicatedness. They may help us cultivate this quality. 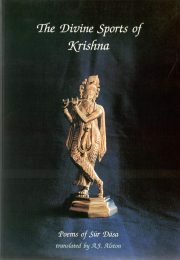 The Divine Sports of Krishna will be of interest to students of mystical literature and popular devotion. Some who are actively seeking inner illumination may find nourishment and insight in these poems.